Tracks 2–10 produced by George Martin. Track 11 produced by Lennon and Yoko Ono. Tracks 12–14, 17 & 21 produced by Lennon, Ono and Phil Spector. Track 15 produced by Ono. Track 16 produced by Lennon. Tracks 18–20 produced by Lennon, Ono and Jack Douglas. October 1979 demo recording; another demo of this song would eventually be re-recorded by the Beatles in 1995. Originally appeared on The Beatles' 1965 album Help! Medley: "Rip It Up"/"Ready Teddy"
^ Cooper, Mark (December 1988). 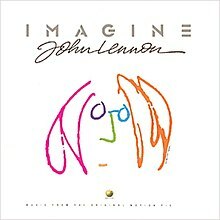 "Re-releases: John Lennon Imagine: Music From The Motion Picture". Q. p. 156.